The fifth earthquake in the area this month occurred Sunday morning in Century. The USGS says the magnitude 2.7 quake occurred at 6:40 a.m. near Century. 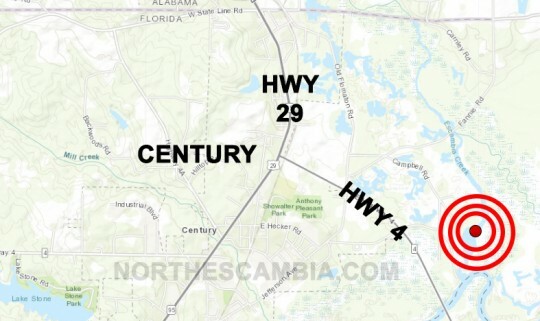 The first epicenter was first reported by the USGS to be in Alabama, but further analysis of the data Monday determined the center to be near the end of Old Ferry Road off Campbell Road. March 13- Magnitude 2.2 earthquake occurred about 1.1 miles south of Pollard, or about 5 miles northeast of Century, at 1:50 a.m.
March 12- Magnitude 2.3 earthquake was centered near Highway 31 and Hillview Drive in Flomaton about 8:26 p.m.
March 11 -Magnitude 3.1 earthquake was reported just outside Flomaton near Old Fannie Road and Welka Road at 1:36 p.m.
March 6 -Magnitude 2.7 earthquake was reported near the intersection of Nelsontown Road and Shell Road between Century and Jay. It is still not too late for Century and the Town Government to repent. The earth has not swallowed them up yet; not yet! Even searching for petroleum causes earthquakes. Even searching for petroleum contaminates drinking water. Only the rich benefit from petroleum. All of these assumptions are provably wrong. It is a shame so many care nothing about proof. In search of oil causing earthquakes and contaminated drinking water, but as long as the already rich make more money who cares! @bryan, best comment yet Lol!!! Maybe these quakes will loosen up some oil for us! and whoever blames fracking, there is no fracking in our area, never has been. I’m almost sure the city counsel is causing this diversion to get our attention off their incompetence. These are known as birth pangs and as we approach the end, disasters will only grow worse in intensity. We are the last generation! Isn’t that just a waste of time when your mind is already made up? Does anyone actually read an article or do you just skim the headlines and react? A fault line maybe? Some things just happen. Not everything is caused by humans. You sound like one of those people that blame every hurricane on climate change. Kevin,you are such a comical man!!!! As there has been no fracking and God hasn’t smitten us yet, gonna have to agree with the article. Seismic activity due to a fracture/fault line. Not man made. Of course, science makes no since to some…. Matthew 24:7 – For nation shall rise against nation, and kingdom against kingdom: and there shall be famines, and pestilences, and earthquakes, in divers places.